Prompt our actions with your inspiration, we pray, O Lord, and further them with your constant help, that all we do may always begin from you and by you be brought to completion. Through our Lord Jesus Christ, your Son, who lives and reigns with you in the unity of the Holy Spirit, one God, for ever and ever. Spiritual Warfare: The Occult Has Demonic Influence | Bishop Donald Montrose D.D. The Jesuit Priest St. Claude de la Colombière was the first to believe in the mystical revelations of the Sacred Heart given to St. Margaret Mary in Paray le Monial Convent, France. Thanks to his support, St. Margaret Mary’s superior also believed, and propagation of the devotion to the Sacred heart was started. According to the 1962 Missal of St. John XXIII the Extraordinary Form of the Roman Rite, today is the feast of Sts. 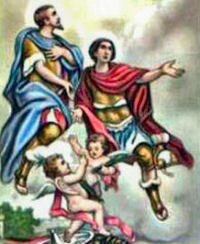 Faustinus and Jovita, two martyrs of Brescia, in Italy, where they are the patrons of the city. A late account of their martyrdom makes them two brothers, one, Faustinus, a priest and the other, Jovita, a deacon. Claude La Colombiere was born on 2nd February 1641 as the third child of the notary Bertrand La Colombière and Margaret Coindat, in St. Symphorien d'Ozon near Lyon in the Southeastern France. His family was well-known, pious and had a good social status. After the family moved to Vienne Claude began his early education there, completing his studies in rhetoric and philosophy in Lyon. It was during this period that Claude first sensed his vocation to the religious life in the Society of Jesus. However, from one of his early notations, we know that he "had a terrible aversion for the life embraced". This affirmation is not hard to understand by any who are familiar with the life of Claude, for he was very close to his family and friends and much inclined to the arts and literature and an active social life. On the other hand, he was not a person to be led primarily by his sentiments. At the age of 17 he entered the Jesuit Novitiate at Avignon. In 1660 he moved from the Novitiate to the College, also in Avignon, where he pronounced his first vows and completed his studies in philosophy. Afterwards he was a professor of grammar and literature in the same school for another five years. In 1666 he went to the College of Clermont in Paris for his studies in theology. Already noted for his tact, poise and dedication to the humanities, Claude was assigned by superiors in Paris the additional responsibility of tutoring the children of King Louis XIV's Minister of Finance, Jean Baptiste Colbert. His theological studies concluded and now a priest, Claude returned to Lyon. For a time he was teacher in the College, then full-time preacher and moderator of several Marian congregations. Claude became noted for solid and serious sermons. They were ably directed at specific audiences and, faithful to their inspiration from the gospel, communicated to his listeners serenity and confidence in God. His published sermons produced and still produce significant spiritual fruits. Given the place and the short duration of his ministry, his sermons are surprisingly fresh in comparison with those of better-known orators. The year 1674 was a decisive one for Claude, the year of his Third Probation at Maison Saint-Joseph in Lyon. During the customary month of the Exercises the Lord prepared him for the mission for which he had been chosen. His spiritual notes from this period allow one to follow step-by-step the battles and triumphs of the spirit, so extraordinarily attracted to everything human, yet so generous with God. He took a vow to observe all the constitutions and rules of the Society of Jesus, a vow whose scope was not so much to bind him to a series of minute observances as to reproduce the sharp ideal of an apostle so richly described by St. Ignatius. So magnificent did this ideal seem to Claude that he adopted it as his program of sanctity. That it was indeed an invitation from Christ himself is evidenced by the subsequent feeling of interior liberation Claude experienced, along with the broadened horizons of the apostolate he witnesses to in his spiritual diary. On 2nd February 1675 he pronounced his solemn profession and was named rector of the College at Paray-le-Monial. Not a few people wondered at this assignment of a talented young Jesuit to such an out-of the-way place as Paray. The explanation seems to be in the superiors' knowledge that there was in Paray an unpretentious religious of the Monastery of the Visitation, Margaret Mary Alacoque, to whom the Lord was revealing the treasures of his Heart, but who was overcome by anguish and uncertainty. She was waiting for the Lord to fulfill his promise and send her "my faithful servant and perfect friend" to help her realize the mission for which he had destined for her: that of revealing to the world the unfathomable riches of his love. After Father Colombière's arrival and her first conversations with him, Margaret Mary opened her spirit to him and told him of the many communications she believed she had received from the Lord. He assured her he accepted their authenticity and urged her to put in writing everything in their regard, and did all he could to orient and support her in carrying out the mission received. When, thanks to prayer and discernment, he became convinced that Christ wanted the spread of the devotion to his Heart, it is clear from Claude's spiritual notes that he pledged himself to this cause without reserve. In these notes it is also clear that, even before he became Margaret Mary's confessor, Claude's fidelity to the directives of St. Ignatius in the Exercises had brought him to the contemplation of the Heart of Christ as symbol of his love. After a year and half in Paray, in 1676 Father La Colombière left for London. He had been appointed preacher to the Duchess of York - a very difficult and delicate assignment because of the conditions prevailing in England at the time. He took up residence in St. James Palace in October. In addition to sermons in the palace chapel and unremitting spiritual direction both oral and written, Claude dedicated his time to giving thorough instruction to the many who sought reconciliation with the Church they had abandoned. And even if there were great dangers, he had the consolation of seeing many reconciled to it, so that after a year he said: "I could write a book about the mercy of God I've seen Him exercise since I arrived here!" The intense pace of his work and the poor climate combined to undermine his health, and evidence of a serious pulmonary disease began to appear. Claude, however, made no changes in his work or life style. All of a sudden, at the end of 1678, he was calumniously accused and arrested in connection with the Titus Oates "papist plot". After two days he was transferred to the severe King's Bench Prison where he remained for three weeks in extremely poor conditions until his expulsion from England by royal decree. This suffering further weakened Claude's health which, with ups and downs, deteriorated rapidly on his return to France. During the summer of 1681 he returned to Paray, in very poor condition. On 15 February 1682, the first Sunday of Lent, towards evening Claude suffered the severe hemorrhage which ended his life. On the 16 June 1929 Pope Pius XI beatified Claude La Colombière, and Pope John Paul II declared him a saint on 31 May 1992. The Universal Church celebrates his feast day on February 15. His charism, according to St. Margaret Mary Alacoque, was that of bringing souls to God along the gospel way of love and mercy which Christ revealed to us. Visit this website for more information about St. Claude. Read "Spiritual Direction of Saint Claude De Colombière". Find more information about St. Claude here. Faustinus and Jovita were brothers, nobly born, and were zealous professors of the Christian religion, which they preached without fear in their city of Brescia in Lombardy, during the persecution of Adrian. Their remarkable zeal excited the fury of the heathens against them, and procured them a glorious death for their faith. Faustinus, a priest, and Jovita, a deacon, were preaching the Gospel fearlessly in the region when Julian, a pagan officer, apprehended them. They were commanded to adore the sun, but replied that they adored the living God who created the sun to give light to the world. The statue before which they were standing was brilliant and surrounded with golden rays. Saint Jovita, looking at it, cried out: “Yes, we adore the God reigning in heaven, who created the sun. And you, vain statue, turn black, to the shame of those who adore you!” At his word, it turned black. The Emperor commanded that it be cleaned, but the pagan priests had hardly begun to touch it when it fell into ashes. The two brothers were sent to the amphitheater to be devoured by lions, but four of those came out and lay down at their feet. They were left without food in a dark jail cell, but Angels brought them strength and joy for new combats. The flames of a huge fire respected them, and a large number of spectators were converted at the sight. Finally sentenced to decapitation, they knelt down and received the death blow. The city of Brescia honors them as its chief patrons and possesses their relics, and a very ancient church in that city bears their names. — Little Pictorial Lives of the Saints, a compilation based on Butler’s Lives of the Saints and other sources by John Gilmary Shea (Benziger Brothers: New York, 1894); Lives of the Saints for Every Day of the Year, edited by Rev. Hugo Hoever, S.O. Cist., Ph.D. (Catholic Book Publishing Co.: New York, 1951-1955). Read more about St. Faustinus and Jovita here and here. Read what the Catholic Encyclopedia has to say about the city in Italy in which they lived. Discover Brescia and if you are a cooking enthusiast try making the authentic Italian dish, risotto allo zafferano, (rice with saffron). Read About: Italian Cuisine and if you are REALLY interested you can learn what arborio rice is. If your not interested in the finer details you can make the recipe in Catholic Culture's database. Today's station is at St. George's. Pope St. Gregory established a diaconia, an institution that cared for the poor, at the site of this church. The area has a special place in the history of Rome, as an ancient tradition claims that it was here that Romulus killed his brother Remus before founding the city.